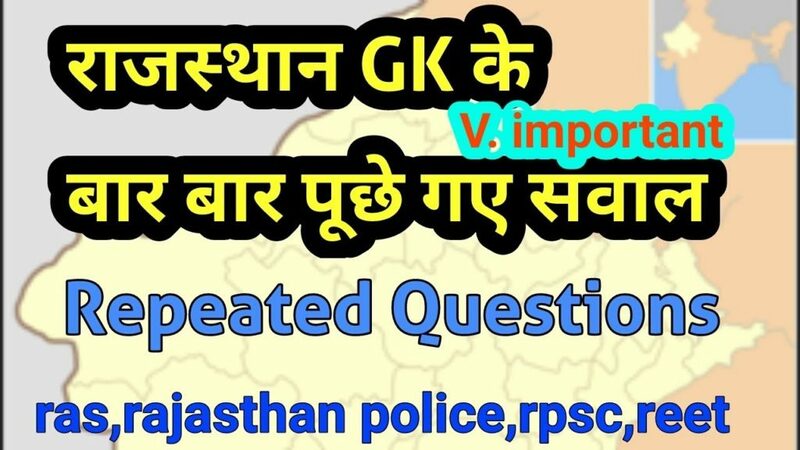 General knowledge questions Date Wise 31-12–2017 GK question With the answer, GK for like Rajasthan police New Exam Date 2017. And Rajasthan police exam Admit Cजोधपुरard And Syllabus 2017and SSC MTS SSC CGL SCC CPO SI Gram sewak, GK Quiz in hindi, And Rajasthan GK for all competition exams, Railway GK Police, CRPF GK, GK for Public service commission, Govt Jobs GK, GK for IAS RAS IPS, India GK, Science GK, Social Science GK, History GK, Chemistry GK, Maths GK, Reasoning GK, GK for competitive exams, computer GK, current affairs, current GK, world GK, Geography GK, RRB GK, RPSC GK,And All subject Wise Notes and Math, Hindi, English, History, Political Science, Psychology, Sanskrit Related Study material. Question (1) Rajasthan’s highest mountain peak? राजस्थान की सबसे ऊँची पर्वत चोटी है? Question (2) Rajasthan is the second largest city? राजस्थान का दूसरा सबसे बड़ा शहर है? Question (3) Rajasthan Day is celebrated? राजस्थान दिवस कब मनाया जाता है? Question (4) which district the area of wasteland is the highest in Rajasthan? राजस्थान में बेकार भूमि का क्षेत्र जिस जिले में सबसे अधिक पाया जाता है? Question (5). Which state is the biggest interstate border of Rajasthan?? जिस राज्य के साथ राजस्थान की सबसे बड़ी अंतर्राज्यीय सीमा है? Question (6) राजस्थान की सबसे कम सीमा किस राज्य की सीमा से लगती है? Question (7) How many states touch the boundaries of Rajasthan? राजस्थान की सीमा कितने राज्यों की सीमाओं को स्पर्श करती है? Question (8). Rajasthan is the length of the border with Pakistan? राजस्थान की पाकिस्तान से लगी सीमा की लम्बाई है? Question (9) Which the state of Rajदक्षिण-पूर्वasthan meets rugged? राजस्थान के किस प्रदेश में बीहड़ मिलते हैं? Question (10) Which area of Rajasthan is the extension of the Vindhya Range? राजस्थान के किस क्षेत्र में विन्ध्य पठार का विस्तार है?